Homemade hummus is the best! 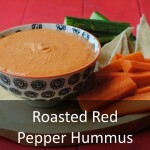 It is cheaper, healthier and so quick to make and roasted red pepper hummus is my favourite flavour because of the smoky sweetness that it has to it. Put all of the ingredients in to a blender/food processor and blend until smooth.